Another Anne Calvert, the wife of Philip, did get to see Maryland first hand. She was born in England, the daughter of Sir Thomas Wolseley of Staffordshire, England. She came from a family of devout Catholics, who suffered persecution in England for their beliefs. 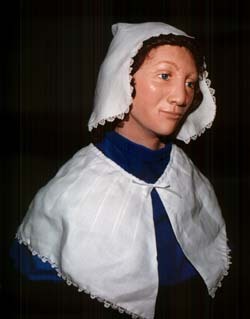 Anne Wosely Calvert came to Maryland with her husband Philip in 1657. The Calverts led a good life in Maryland, living in a large mansion, but Anne still suffered, especially near the end of her life. She had a fondness for sweets and lost all but five of her teeth, making if very difficult to eat. At some point, she broke her left leg very badly, causing her to limp painfully for the rest of her life. When Anne died in 1681, she was malnourished and suffered from osteoporosis and arthritis. Much of what we know about Anne comes from the recent discovery of her coffin in the ruins of an old brick chapel in St. Mary's City, Maryland. Her skeleton was very well-preserved, providing many clues about Anne's life. She was a small woman, only about 5'3" tall. She must have been well-loved, as she was carefully buried in a shroud, with silk ribbons tied around her wrists. Scientists also found bits of rosemary, the herb of remembrance sprinkled over her body. Her husband Philip, and a 6-month-old girl, probably Philip's daughter by his second wife, were buried next to Anne in a prominent part of the chapel. Papenfuse, Edward C., "The Forgotten Mothers of Maryland," Speech to the Society of the Ark and Dove, November 19, 1995. Topic File: Lead Coffins, St. Mary's City. MSA SC 1456-1945.